M35 is located at a distance 2800 ly and has estimated age about 110 million years. It is relatively diffuse, with about 2500 stars spread out over a volume 30 light years across. The hottest main sequence stars in the cluster have the spectral classification B3. M35 also contains more evolved stars, including several orange and yellow giants. The cluster is approaching us at 5 km/s. 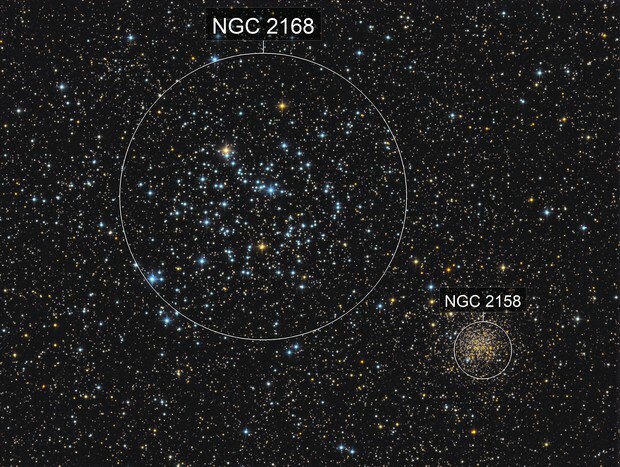 Another open cluster, once considered as a globular cluster, NGC 2158, lies about 15 arc minutes to the southwest of M35. NGC 2158 is considerably older (2 billion years old) and more than five times more distant (~12000 ly). 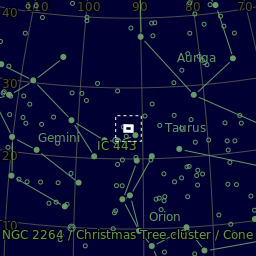 It is also more compact and contains more stars. Having also low metalicity it is suggested to be a member of the old disk population.